Imagine an unspoilt Mozambique island within a National Park, deserted beaches of pure white sand, sparkling turquoise seas crisscrossed by local dhows plying their trade, swaying palms, sunny days and star studded nights and you have Azura Mozambique. 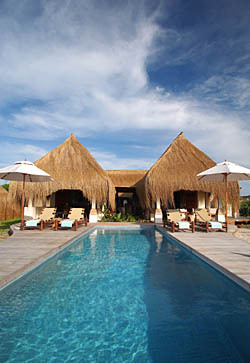 Our handbuilt villas blend modern chic with all that is traditional in Mozambique. The creature comforts you would expect from a luxury boutique resort are there, set off by locally sourced wooden beams and traditional artwork beneath a thatched jekka roof. Wander down to the pristine white beach and welcoming azure sea beyond. 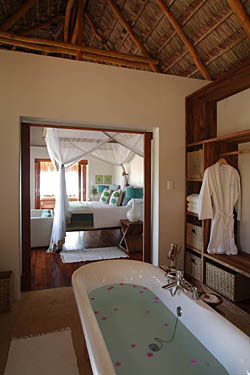 Lounge around on plump cushions on your daybed, or tan in private and cool off in your sparkling plunge pool. Dine on your deck, or sip champagne in your beachside Sala as the sun goes down. Lie in your bath and gaze at the view, or shower beneath the stars. Do whatever you want to do. Our villas are a welcoming place to stay. You may not want to leave them at all. 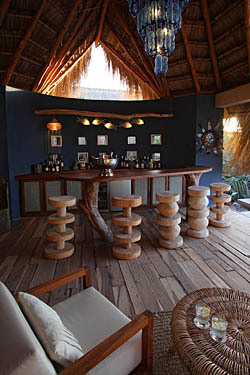 You'll have a dedicated Mozambican host to look after you during your stay. 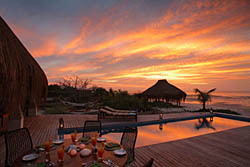 They'll take care of all your needs, including serving your meals, arranging activities and joining you on excursions . They are part of Azura's commitment to the community and upliftment of the country's people. Many of them have very little in the way of formal education, but they have a genuine warmth and friendliness, and will delight in looking after you. Azura has 11 Infinity Beach Villas. 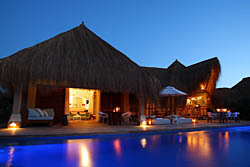 They are furnished in contemporary style and look out over a stunning infinity pool towards the beach and sea beyond. They have the best of our beachfront locations. New for Azura's re-opening is Villa Amizade, which means friendship villa in our native Portuguese. 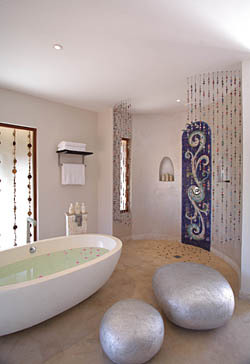 This 2 bedroom en-suite villa is located at the western end of the property, and offers more than 185 m2 under roof. .Master bedroom with king size bed, indoor/outdoor feel with doors opening up on 2 sides of the room to lounging decks, ensuite bathroom with freeform bath, indoor and outdoor showers, air-conditioning. The epitomy of style and luxury, with its own unique décor, the Presidential Villa at Azura is one of the most luxurious private residences to be found anywhere in the Indian Ocean. 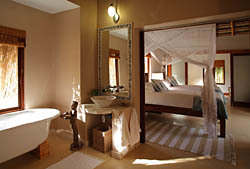 It has two en suite bedrooms, a third staff bedroom, indoor and outdoor bathrooms, a sitting room with fireplace, dining area with 'wine bar', and huge infinity pool spanning the front of the villa. 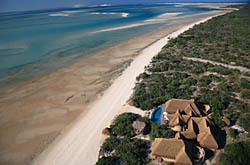 It is located just footsteps from the beach at the end of our property to ensure maximum privacy, and has uninterrupted panoramic views to Bazaruto Island and the Indian Ocean beyond. .Huge split level master suite with king size bed, oversize mosquito net, sitting area, massive bathroom with panoramic freeform bath & shower, separate toilet, dressing area, his & hers indoor and outdoor showers, air-conditioning and fans.